You’d have to look far and wide to find a one-year old pup as well-behaved as my mutt Otis. I have the advantage being a dog trainer and having lots of time to work with her. But perhaps the most important reason she is such a balanced, happy dog is that she gets at least a hour of full-on exercise each day, sometimes more. In the scheme of actions you can take to build a better dog, at the tip-top of the list is exercise, and at the top of THAT list is leashed walks. (Next in order of importance is direction/training, followed by affection/love.) Too many people have frustrated or neurotic dogs because they get it backwards, giving too much affection, little direction and little or no exercise. 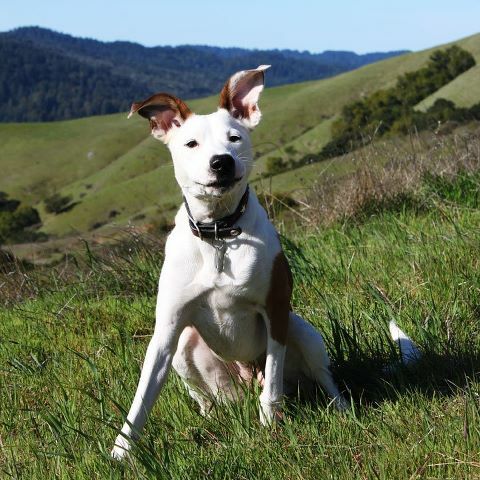 This photo was taken on Otis first birthday, at the Loma Alta Open Space Preserve in Marin County, in the middle of a 3-hour hike. That hike was the best birthday gift we could give her. We posted this photo on Facebook and got lots of comments comparing Otis to Maria Von Trapp in “The Sound of Music.” Those hills were, in fact, alive! Loved this one. What a great picture of Otis!! And I’m sure with her energy and your enthusiasm, the hills truly were alive.